You're in your twenties. You moved to the North End, because it's sooo cute, and not like, ummm, like sketchy? Regardless, you find yourself starving, straggling back from Ned Devine's in your striped button down shirt. Maybe you're not wearing a button down shirt. Maybe, you're a female. Well, we all get hungry. And Monica's is closed. It closed three hours ago. You look to the left--an alley. What's down there? I don't know. 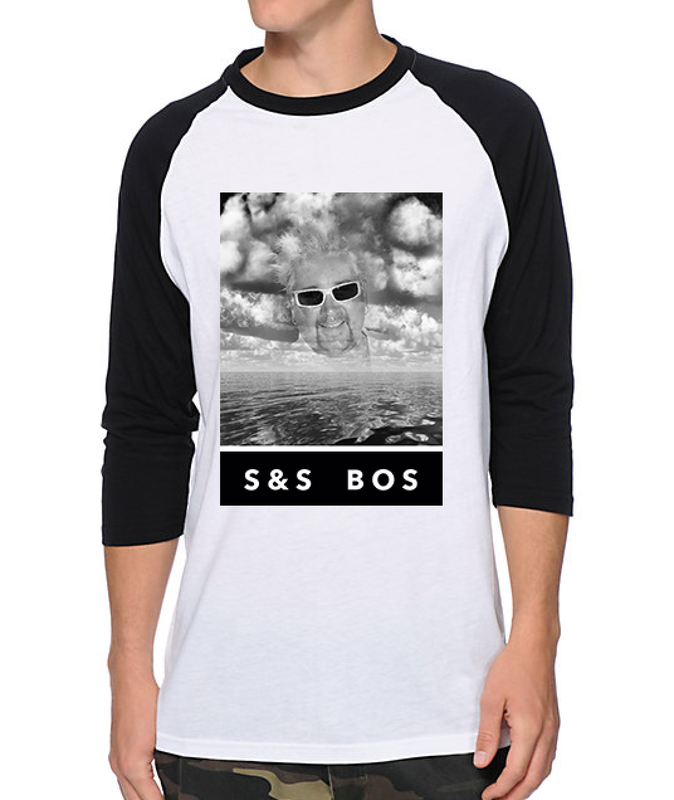 You look to the right--Bova's. It's open. It's always open. 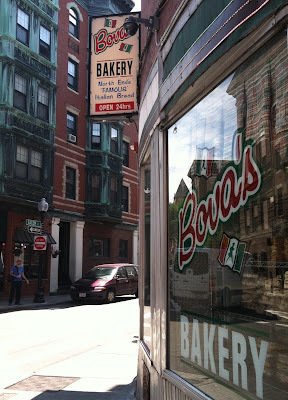 Bova's Bakery, "a North End tradition since 1932," has been baking bread for long enough to remain indelible in the minds of "Old Timers." In fact, Bova's claims that if you ask an Old Timer the name for a "big old sandwich loaded to the gills with all the trimmings," said Old Timer will tell you that is a Spuckie. This term undoubtedly lands on the deaf ears of the aforementioned button-down brigade, yet it still holds weight among Old Timers throughout Massachusetts, on certain menus and among people who have tragically mangled the history of the Spuckie, and front and center on Bova's menu. 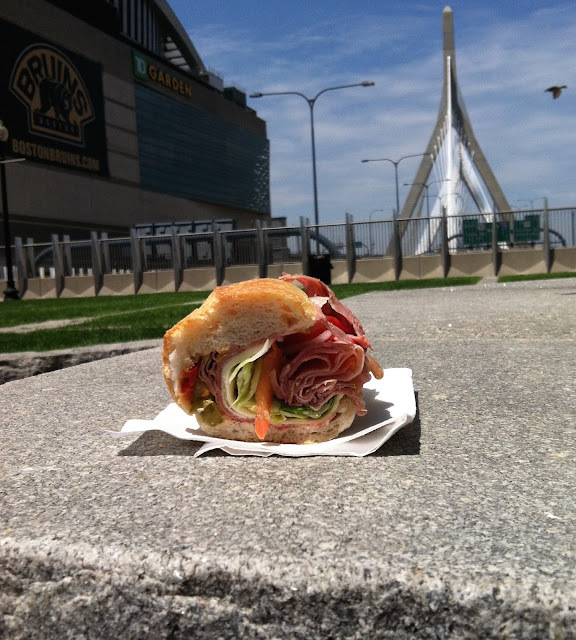 The spuckie, short for spucadella, an Italian roll used for sandwiches, is inherently Boston. It represents the history of the Italian sub's evolution through Italian emigration to the US, and connects generations of satisfied sub savages. At Bova's the Spuckie features salami, mortadella, capicolla, and provolone. Without seating at Bova's, Matt E. Bonez sampled the sub in the shadow of the Garden. Click the video below for the exclusive one-bite review. The spuckie is a traditional Italian. The meats are jam-packed in a fresh baked roll. The roll is Bova's claim to fame, and while it's not the best roll in Boston, it is very, very good. It has a light interior with a crispy exterior that is a reflection of a quality recipe opposed to an overcooked roll. The crunch does not ruin the roof of your mouth, yet still holds the ingredients all together. On top of the meats and cheese, lettuce, tomatoe, onions, a simple, yet flavorful vinaigrette, and a hot relish round out this textbook sandwich. At the price, 6.95, the Spuckie is a value sub, which does not skimp on the ingredients. The ingredients were layered very interestingly, with hots, meat, cheese, toppings, more meat, which was a unique twist. Unsure if this was intentional, yet it was something new. These meats aren't elite quality, but they're still high-quality and tasty. It's not the very best, but it's good, cheap, and served 24/7. If you're on the corner of Salem and Prince at noon, go to Monica's. But at three o’clock in the morning, a Spuckie has an importance unlike anything else, and the cure may not work on your hangover—and on a real hungry night at Bova's, there are always Spuckies at three o’clock in the morning, day after day. 8.5/10 on the Italian Sub Scale.